Image: Kelly Sullivan/Getty Images. Design: Ashley Britton/SheKnows. 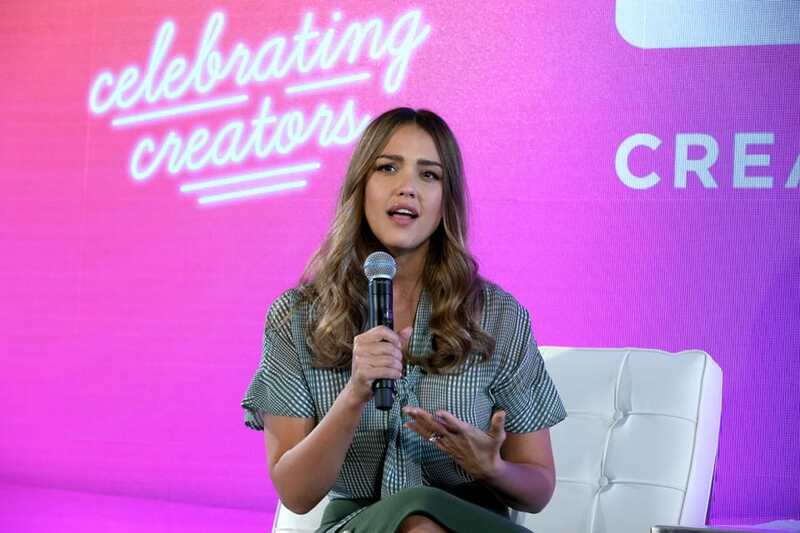 Actor, entrepreneur, beauty maven, mom of three and SheKnows #BlogHer18 Creators Summit speaker Jessica Alba knows how to juggle. Despite acting, momming and running her multimillion-dollar natural home/beauty/baby products brand, Honest Company, Alba still finds time for travel, cooking, face masks, getting nerdy with her in-house chemist, picking all her kids' outfits in advance and creeping on her mom pals' Instagram accounts. Stars: They really are just like us. Ahead of her much-anticipated keynote at this Thursday's BlogHer18 Creators Summit in New York City on Aug. 9, we chatted with Alba about her successes and struggles with motherhood, business and more — and got the scoop on her favorite products and go-to breakfast (hint: It's so millennial). SheKnows: Welcome back to LA — are you returning from somewhere cool? Jessica Alba: My family and I just came back from my favorite place in Mexico, the Rosewood Mayakoba. They have a sweet kids area space there, a playroom, a nice spa, a great gym, a good restaurant and the staff is lovely. You ride bikes everywhere. SK: And you get to canoe through the mangroves! I was near there recently — small world. So, when you're back home, how do you like to start your days? JA: It depends. I don't have that much of a routine because I have two jobs, really, and so if I'm going to do a workout, I usually try to do that before the kids and everyone gets up. So I'll wake up really early and go and do that, and by the time I come home, that's when everyone's waking up, and I'm making coffee and the kids' breakfast. And I'm usually eating avocado toast [laughs]. SK: I mean, aren't we all [laughs]. Speaking of food, you commented on one of Mindy Kaling's Instagram posts recently, asking Kaling to text her "recipes baby will eat" — it was adorable. What sort of parenting tips and tricks have you gotten from co-celeb moms in the know? JA: I mean, I comment on people’s posts all the time who aren't famous too; I don’t treat people differently whether they're famous or not. If your kid is around the same page as mine, I’m going to be asking you questions. SK: It's not a relief to commiserate with other moms who are also in the spotlight? JA: Well, I also have an office job as much as I have a spotlight job. Any mom friend of mine, we all kind of commiserate on the day-to-day. SK: Have you encountered any of the dreaded mom-shaming? JA: I've been in the public eye for 15 years, so I think I’m used to it. I don’t really pay attention to it. I just feel like people who take the time to write something negative about someone they don't know — that's probably kind of a sad and lonely person. So that’s how i think about them; I'm happy I'm not in their situation. SK: Of course. Do you have any specific self-care routines or ways you like to take time for yourself? JA: It's my Sunday nights. Getting the baby to bed is the big thing, so sometimes, I'll let the girls watch a show for an hour in bed — because at least then they're in bed — so that I can take a bath. I like taking baths on Sundays — and doing some version of a face mask or hair mask, plus bubble bath. SK: What are your favorite beauty products? Does it feel like cheating if you say something that's not Honest Co.? JA: Well, when you make your own products — and I actually have a lab here — I get to pick my favorite beauty products from around the world and bring them to the chemist and say, "How can we make this clean?" I can say, "Here's what I like about this and what I don't like about this." Really, I use all of our products, and whatever we don't make, I'll experiment and try other ones out there. There's a great body scrub I like to get from The Little Market. What I like about them is they help women who are in underserved communities; they employ them to change their situation and change the course of their lives. So it's super-empowering knowing how the company gives back and the impact they're having on communities and women. SK: Did you pack Honest stuff in your hospital bag when you went to give birth? And what else did you bring? JA: I did. I brought a cozy change of clothes to go home in, and then I brought, you know, my toothbrush, and we have something called the Magic [Beauty] Balm, this salve that you can use on your face, on your lips; I used it a lot during labor because I got such dry lips. You can use it on the tops of your cheekbones, and I use it around my eyes. I brought that, my eyelash curler, cream blush because it looks more natural… and concealer. And our baby wipes and hand sanitizer and diapers. SK: A whole Honest haul! What’s up next for the company that you’re most excited about? JA: We have a lot of cool things that are coming out. I’m excited about our beauty line… I love working with my chemist in-house and developing products and working on the branding and messaging. And then with our baby products, we have two skin care lines that we’re working on, and we have a brand-new diaper that we’re launching; it's new and improved, more absorbent, softer, fits better. And then we have… gift sets that we're going to be launching. I collaborate with my husband on some gift sets since he has a company called Pair of Thieves that makes socks, underwear and T-shirts… It’s really fun, and we both launched our companies around the same time. SK: You breastfed all of your kids; did you have any struggles with that process like so many of us moms do? JA: I did breastfeed all my kids. You know, I think what’s difficult about it is you’re tethered to the baby. And babies… they’re not really on a schedule. They're just growing and sleeping and eating, and we're so programmed to have a schedule and kind of do what we want to do, so leaving the house when you have a completely unpredictable baby is, to me, what was difficult. It’s hard to leave the house. At home, it’s easy. You’re just in pajamas… you can feed whenever the baby feels like it. They can sleep. But when you're out, and they're falling asleep in the car seat, it's like, is that uncomfortable? How long does that last? And where can you feed or change them? Since there aren't a lot of public places to change your baby that aren't covered in gross germs. SK: Which is so crazy in this day and age. SK: Any tips for preparing for back-to-school? You seem like you might be a list-maker. JA: We are indeed list-makers, and we are back-to-school shoppers. We always take a picture in the morning on the first day of school. We pick out the kids' outfits; I actually always pick out my clothes the night before, so that’s one less thing we have to worry about, down to the hair accessory, the shoes, socks, the full nine. We always have the backpacks ready to go at the door, and for me, I always have my workbag ready to go as well. When you set it all out the night before, you don't have to argue or freak out or change 50 times. It's just, you're wearing this; I'm wearing this. The end. SK: And what about after school? What sorts of activities are your kids into these days? JA: They have different activities each day. I try not to overschedule them with pure academic stuff. They go to math camp, they have Spanish, and Honor has a tutor. But then Honor likes to do musical theater, so she does voice lessons, and Haven likes playing the guitar, so she has guitar lessons. Haven sometimes does soccer depending on the time of the year, and Honor does tennis. So they've got some sports, some academics and some other fun after-school [activities]. I mean, at least it all keeps them off their screens. That's the important thing, right?